I love a great meatball, but until recently I've stuck with the traditional Italian-style ones. Recently I've found myself perusing cookbooks, websites and magazines looking for other ways to eat meatballs other than just in a red sauce over pasta or in a sandwich. 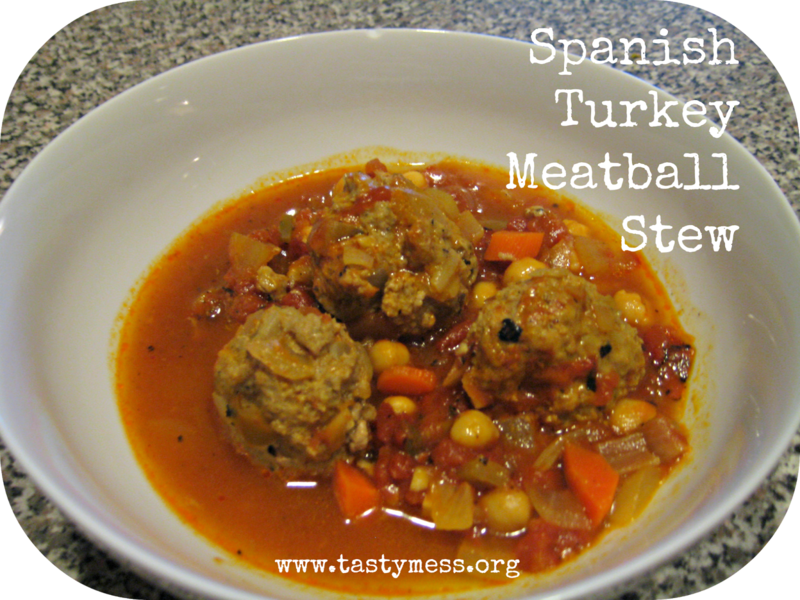 I came across an idea for meatballs in a stew and marrying them with spicy flavors seemed right up my husband's alley - of course I had to give it a try. This can be a fairly spicy dish, so if you're a fan of milder flavors I would suggest swapping out the fire-roasted tomatoes with chilies for petite diced tomatoes. The flavors will still be delicious, I promise! Heat the oil in a large dutch-oven style pot over medium-high heat until shimmering. Add in the onion, garlic and a generous sprinkle of salt and pepper. Cook until softened, then add in 1 tsp. of the paprika. Transfer half the mixture to a large bowl. Add the rest of the paprika and carrots to the remaining mixture in the pot and cook for just a minute or two. Pour in both cans of tomatoes, chicken broth and chickpeas. Bring to a boil, then reduce to a rapid simmer and cook until the sauce thickens slightly. Add the ground turkey or chicken and a generous sprinkle of salt and pepper to the bowl with the rest of the onion mixture. Mix well with your hands and form the meat mixture into golf-ball sized meatballs. Place the meatballs gently into the sauce/stew mixture and simmer. Cook for about 7 minutes, then turn the meatballs over, cooking for another 7 minutes until done. Serve hot with freshly grated Parmesan on top.